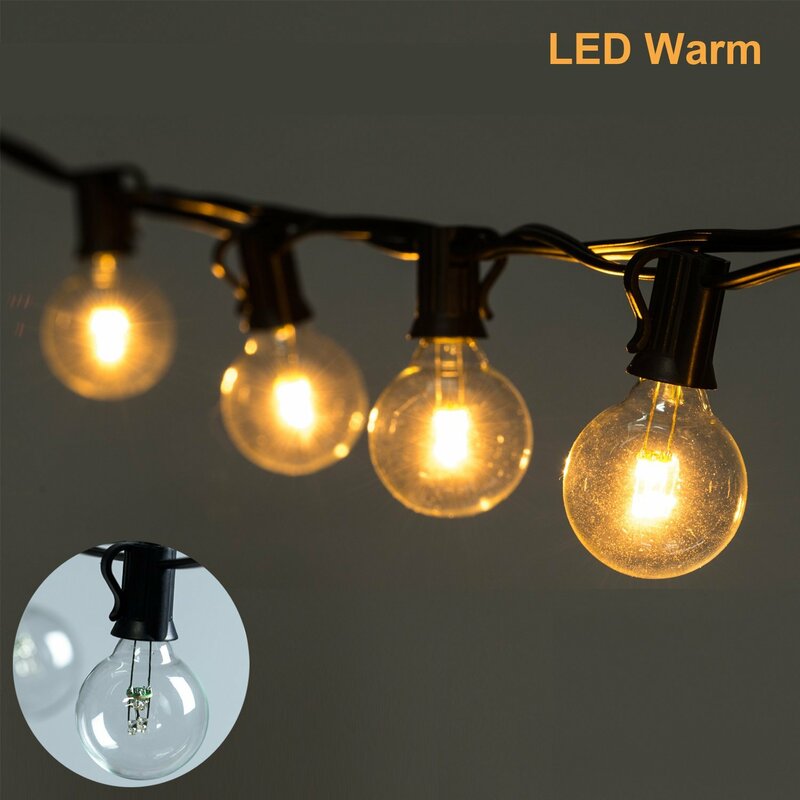 Home › Energy-Efficient LED Lighting › 25Ft Led G40 String Lights With 25 Led Warm Globe Bulbs-Ul Listed For Indoor/..
25Ft Led G40 String Lights With 25 Led Warm Globe Bulbs-Ul Listed For Indoor/..
25 feet long string with 25 LED clear G40 Bulbs,connectable up to 40 strands (=1000 Ft),much longer than traditional bulb type. LED Light bulbs have candelabra (E12) socket base, 0.5W/Bulb, much lower wattage will save you much bill, cool to touch. We offer 1-Year quality guarantee. Please contact the seller directly if you have any quality problems. Color: LED G40-Black Wire 25 Ft LED Globe G40 String Lights Set with 25 LED Warm White G40 Bulbs Included End-to-end - UL Listed Indoor & Outdoor Lights Settings Patio String Lights & Christmas Decorative Lights & Holiday Lights & UmbrellaLights Perfect for Backyards, Gazebos, Gardens, Pergolas, Decks, City Rooftops,Weddings, Bbq, Dinner Parties, Birthday Parties, Gatherings Commercial Quality String Light Fixture for Indoor / Outdoor Use With Updated Energy-efficient Bulbs Bulb Count: 25 Bulb Spacing: 12 in. Diameter of Bulb: 1.5 in. Bulb & Socket Type: G40 w/ a C7 / E12 base Lighted Length: 24 ft Total Length (end to end): 25 ft Length of segment from plug to 1st bulb: 1/2 ft (6 in.) UL Listed for Indoor & Outdoor Use. Connect up to max. of 20 strands LED Globe G40 String Lights is perfect for any special occasion, adding a warmand charming festive accent to your gatherings. Brightown offer one-year quality guarantee for all products.